Line an 6 or 7" pan with strips of parchment paper for easy removal, and grease well with coconut oil. Set aside.In a mixing bowl, stir together the shredded coconut, almond flour, melted coconut butter, melted coconut oil, and maple syrup. Press the dough evenly along the bottom of the prepared pan.In a high-powered blender (I used my Vitamix, but most powerful blenders should do the job), combine all of the filling ingredients and blend for about 2-3 minutes, or until the mixture is silky smooth and creamy. You may need to add a bit more coconut milk or lemon juice to get it to blend smoothly if your blender isnt super high-powered.Once its smooth, taste the mixture and adjust the sweetness/tartness levels, if desired. Pour the filling into the prepared pan over the crust and smooth the top. Place in the freezer to set for at least 3 hours or until completely firm before garnishing, slicing and serving. For the garnish, use a parish knife to peel the citrus fruits. Slice the citrus, and dry each side with a paper towel. Arrange on top of the cheesecake. 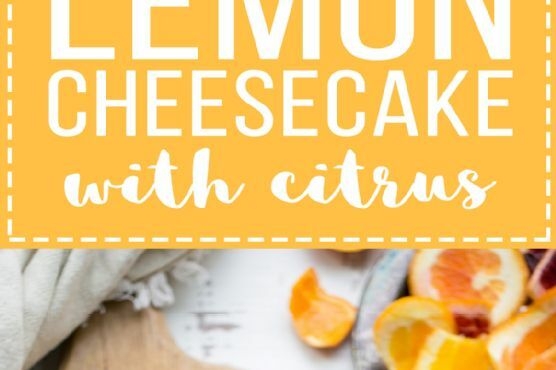 I recommend doing this right before serving, so the citrus is freshest.When serving, I recommend running your knife under hot water to warm it up before cutting the cheesecake with the still-hot (dried) knife. Lambrusco Dolce, Late Harvest Riesling, and Sauternes are my top picks for Cheesecake. White dessert wines are a safe pick for cheesecake (without chocolate), but a sweet lambrusco will be so good with classic strawberry cheesecake.